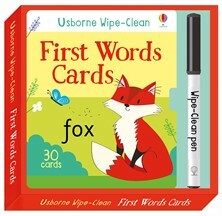 These wipe-clean cards can be used again and again to help children develop vital reading and writing skills. There are 27 simple words to learn, and each card features a picture, outlines to write over and space to write alone. The cards will help children learn letter shapes and practise pen control, and there are ideas for games to play too.